1965:160 nom. nud. [a form of Echinocereus pulchellus]. It is a small clumper with great flowers . 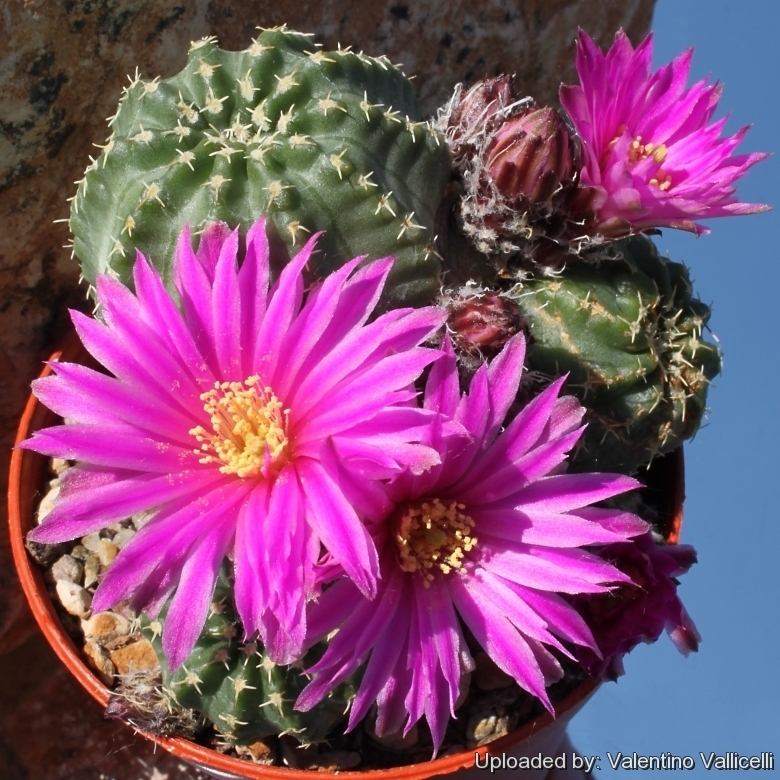 Description: Echinocereus aguirrei is one of the several forms of the very variable Echinocereus pulchellus which form a complex of related taxon. It is still unclear whether this variable complex is one or several species. There is so much variation that most authors choose to lump them together. Echinocereus aguirrei typically forms small clumps and produces great pink flower and is very similar to Echinocereus amoenus and the two are frequently confused. The 'aguirrei' form differs from subspecies 'pulchellus' in that the stems are not so crunched against each other, they’re a bit taller, and the tubercles stand out more. The body colour is also different, being a lighter green to grey green, tending toward bluish on some individuals. Habit: Solitary or slowly clumping, often shrinking into the ground during drought. Blooming season: Spring. Plants start flowering when only few centimeter in diameter. Fruits: Globose, small, nearly dry at maturity, with few seeds.